Stocks started sluggish, but investors eventually found the coffee machine and woke up. 1. 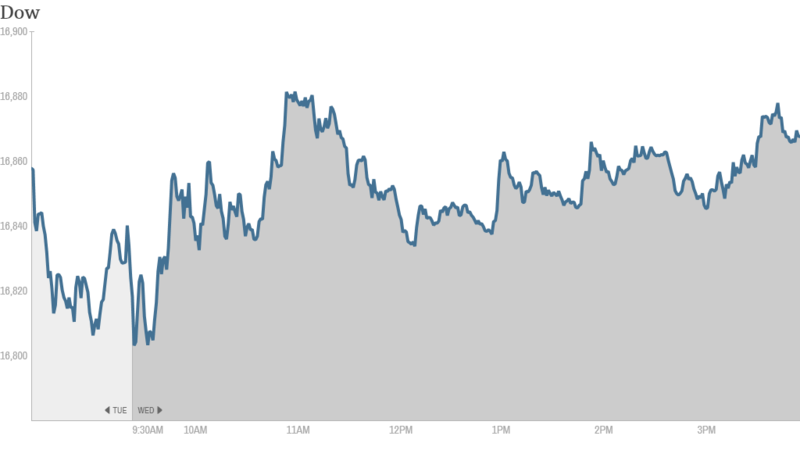 Stocks on the rise: The Dow rose nearly 50 points (0.3%), while the S&P 500 moved higher by 0.5%. The Nasdaq lead the way, gaining almost 0.7%. It's a turnaround from Tuesday when the Dow Jones Industrial Average had its biggest one-day percentage drop in more than a month. 2. Aereo ruling sparks media madness: The Supreme Court provided one of the biggest market moving moments of the day. CBS Corporation (CBS) skyrocketed as much as 7% after the Supreme Court said streaming service Aereo's business model violates broadcasters' rights by using tiny antennas to snap up content on public airwaves. Shares of Disney (DIS), which owns broadcaster ABC, also jumped on the news, as did Comcast (CMCSA), owner of NBC, and Twenty-First Century Fox (FOXA). But media companies that own local affiliate stations experienced the biggest bounce, since they rely on redistributing content, which is essentially what Aereo does. Shares of the Sinclair Broadcast Group (SBGI), the Tribune Company (TRBAA), and Gannett (GCI) all surged. 3. Movers and shakers -- Google, Barnes & Noble, General Mills, oil refiners: Google (GOOGL) popped over 2% after the tech giant revealed plans to expand its Android software into television, smartwatches, and cars. Barnes and Noble (BKS) shares soared as much as 10% after the struggling bookseller said it has begun taking steps to separate its retail and Nook segments. But the stock has since pulled back a bit, closing up 5%. 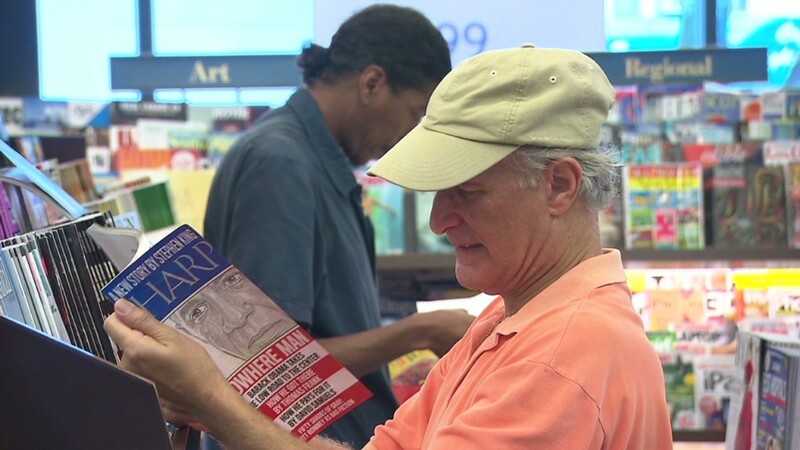 Still, one StockTwits trader wasn't convinced that the move would help Barnes and Noble that much. "$BKS spinoff should be interesting but does not solve the problem," said notelonmusk. Oil refining stocks took a hit Wednesday after news that the Commerce Department ruled that two companies will be able to export an ultra-light form of oil,, despite a long-standing ban on exporting crude from the U.S. Investors were worried the decision would lift oil prices and make the cost of business more expensive for oil refiners. Valero Energy (VLO) sank 8% and Marathon Petroleum (MPC)fell 6%. General Mills (GIS) slumped after the cereal maker reported disappointing earnings that were stymied by expensive promotional activity that didn't translate into greater sales. Apollo Education (APOL) ticked up after the for-profit college operator beat earnings estimates. Still, the company said degree enrollment sank significantly at the University of Phoenix. And Monsanto (MON) rose 5% after the company announced a big share buyback and strong quarterly results that topped Wall Street expectations. 4. Ugly GDP figures aren't a huge concern: The Commerce Department said the economy shrank 2.9% in the first quarter, even uglier than the 1.8% decline that economists from Briefing.com had predicted. Analysts were expecting a weak final figure for the period, which included unusually harsh winter weather. In that regard, investors are largely shrugging off the bad news, and have donned their forward-thinking caps. 5. International action: The Dubai stock market suffered a dire tumble to start the week, as concerns about continued turmoil in Iraq damaged investor confidence and one of Dubai's biggest construction companies reported trouble. However, the benchmark Dubai Financial General Market Index recovered about 6% on Wednesday. Russia's main Micex index declined by over 2% on reports that the West might slap more sanctions on Russia. The Micex has been on a wild ride this year, dropping by over 20% and then fully recovering as worries about the Ukraine crisis and sanctions intensified and then receded. All major European markets closed lower Wednesday. Asian markets ended in negative territory.